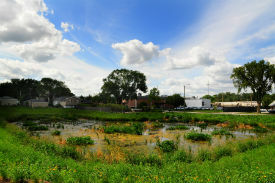 The naturalized basin and stormwater improvements made at 2nd Street and Cumnor Road have earned the Village the 2012 Outstanding Civil Engineering Achievement Award (projects under $5 million) by the Illinois Section of the American Society of Civil Engineers (ASCE). The project was designed in-house by Village of Downers Grove engineers Nate Hawk and Andy Sikich, with the assistance of several consulting firms that provided surveying, landscape design, stormwater modeling support, and construction management services, including V3, Engineering Resource Associates, Hitchcock Design and others. The award will be presented to the project team at the ASCE Annual Dinner and Awards Ceremony on October 10, 2012. See the Village's photo gallery of the 2nd and Cumnor Improvements on our FACEBOOK page.